The second section of the Seventh Military Zone warned Rodrigo Medina de la Cruz that thanks to the complicity of penitentiary authorities, Los Zetas obtained in the prison of Topo Chico some 15 million pesos per month for cobro de quotas ( extortion ), sale of drugs and other business, funds that permit the financing of the devastating narco war currently in the state of Nuevo Leon . The warning occurred to half of the administration of Medina de la Cruz, but it was not unique: investigators from the Autonomous University of Nuevo Leon published the book " Prison and Family", challenges for social cohesion and development of the 21st century, in which they document the tragedy that families live with in the criminal prisons of the state. Also, Human Rights Organizations warned about the time bomb that threatens the prisons together with organized criminals that have been detained for common crimes. Military intelligence emphasize that no less than 5 million pesos of the total that was obtained by Los Zetas in Topo Chico was destined for bribes of prison officers, Chief of commissary, and the directors of the prison. In military circles it is rumoured that the bribes also arrived to the commanders of the Secretary of Public Security. Topo Chico prison operated in a similar manner to the rest of the prisons controlled by organized criminals in the region, among them Altamira, where 80% of the extortion phone calls originated in the North East. In the Gomez Palacio prison, Durango, members of organized crime imprisoned, left the prison at night in official vehicles with weapons to carry out a series of killings that occurred in the bars of Torreon, Coahuila. The most scandalous and dramatic case occurred in Cereso #2 of Piedras Negras, where Los Zetas assassinated, between 2009 and 2011 more than 150 men and women whose bodies were burnt. Included in this prison. was the Zeta Capo Omar Trevino Morales, El Z-42, who hid in the prison when the marines were carrying out an operation to capture him. In September of 2012, 132 prisoners decided to leave through the front door of the prison. In Nuevo Leon, on the 31st of December 2011, Los Zetas showed the control they maintained over the Topo Chico prison. 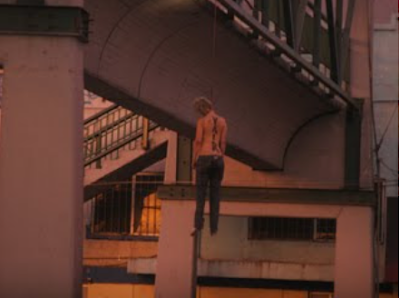 That day they mounted an operation to remove from the prison, Gabriela Muniz Tamez, "La Pelirroja", and hung her from a pedestrian bridge on Colonia Mitras Norte in Monterrey, since she was the girlfriend of a capo of the Cartel del Golfo. The image of the woman hanging bare-chested was shown around the world. (Otis: see link to BB reporter Smurf 's article about this). Despite the warning received by the Army, Governor Rodrigo Medina de la Cruz did not move to retake control from the criminals, even when the murders of custodians and chief guards occurred on a daily basis. In the Topo Chico prison, before the recent massacre, there were 3.900 inmates in a prison designed to house a maximum capacity of 2500. The civil association of citizens in support of human rights has documented that prisons like Topo Chico have their own Zeta auto government. This system is possible thanks to the complicity of the authorities of the penitentiaries, but also because the the ratio of guards to prisoners is 84%, that is to say that there is only one guard for no less than 100 prisoners. Consuelo Morales, director of Cadhac, mentioned that the auto government of Los Zetas in the prison of Topo Chico control the sale of drugs, food, space to sleep, water and all type of articles. "Every new intern gets extorted in order not to be beaten or killed that on average goes from 1500 pesos per week up to 50,000 monthly", assured Morales. He confirmed that the families of the prisoners pay these extortion's weekly or monthly with installments of between 500 to 2000 pesos. He emphasized that Cadhac has evidence that close to 60 percent of the prisoners pay these extortion's. If the government of Medina didn't intervene in Topo Chico, the Federal Government also did nothing to remove the dangerous organized criminal prisoners, who were controlling that and other prisons. After the defeat of the PRI in Nuevo Leon, the independent governor Jaime Rodriquez Calderon solicited to Renato Sales Heredia, national commissioner of security, to transfer the prisoners of Federal jurisdiction to Federal prisons. Renato Sales and El Bronco agreed to the gradual transfers of prisoners, but the convention stayed only on paper and wasn't activated until the killing of the 49 inmates from Topo Chico. one of the prisoners that was going to be transferred was Jorge Ivan Hernandez Cantu "El Credo", the zeta capo that controlled Topo Chico, but police sources warned him and he promoted an amparo not to be removed from this prison. Meanwhile Juan Pedro Saldivar, El Z-27, arrived at Topo Chico thanks to an amparo that promoted in the Maximum Security prison in Matamoros, which an corrupt judge who argued that the prisoner didn't have to be in this type of prison. Apart from the point that they are members of Los Zetas, the capos disputed the control of Topo Chico. The two moved in the interior surrounded with 20 prisoners who had the function of bodyguards and looked after them day and night, in their luxurious cells where they enjoyed the pleasures offered by five star hotels. Daily, women arrived at their cells that appeared in some nigh time programmes of local tv, but if the wives, daughters or sons attracted them, they sent for them. Due to this situation, the young women who came to Topo Chico did so without cosmetics, with dirty clothes and as bedraggled as possible. The night of Wednesday the 10th of February, around 11pm, the group of "El Z-27" commenced to search for their rivals to assassinate them while "El Credo" was enjoying a conjugal visit. The numerous group of followers of "El Z-27" moved freely through the whole prison and took the C2 and C3 outpatient inmates and took them to the courtyard, and proceeded to beat them to death. Meanwhile the rival group commenced their defence. Even though the details are not known, some of the families of prisoners recounted that after a few minutes the riot started and prisoners set fire to the kitchen, the food cellar and other points of the prison. At least five inmates were beaten and dumped on mattresses and set on fire. The riot carried on for about 40 minutes and at 11:52 a mutiny inside Topo Chico was reported to the Ministry of Public Security. When General Atunez, the Secretary for Security, arrived to take control of the situation, he found scenes of dozens of dead in different places, many in the courtyard as well as another 50 inmates injured. Around 40 of those were transferred to the visiting rooms for lawyers where they were attended by paramedics; close to ten of those with grave wounds left in ambulances to hospitals. With the intent to evade his responsibilities, El Bronco assured that the situation was inherited from Rodrigo Medina a time bomb which exploded on him 120 days into his administration. Soledad, thirty years ago it was known as a Gladiator school.Does it still have they same reputation? @ 1022 Well I got locked up for a dui, I'm not going much into detail but it was a felony case.. anyway the experience in soledad was not that bad, compared to mexico...but there is corrupted guards and gangs controlling certain things..it all depends in your luck and how big or willing to fight you are...the norteño are really strong and the sureños are crazy, among the other gangs black and white....the problem here is corrupted officials...the law is only good if it applies to everyone regardless of gang or corruption pressure...I personally I'm a huge paisa, fat and tall, they used to call me cabezon, because I looked like a fat mexican troll..but I never got raped because I paid off for protection , I figured is better to stay of politics and fight when needed..there was a case where some cholos where due for release, and because of pressure from the gangs they where order to attack rivals days before and end it up doing more time...so in mexico I figured is the same , but more extreme with no laws....I think the solution in mexico is to make levels, like here, so the crazy ones don't corrupt the ones doing less time..
O so now the TV stations are getting in on extortion?Did they learn it from PRI or doesn't crime or PRI own Televisa? Just what Mexico needs-Another protection racket!Looks like Italy has nothing on Mexico.They are THE masters. And the Empire screams at Cuba for human rights. How the Empire and Darth wish Cuba could be recreated into a Mexico or Guatemala or Afghanistan or another narco state they control! Tell him to go to Mexico to start an Arab Spring against the Mexican politicos! Bottom line....there is corruption at every level of the Mexican Government....what is new???? Let them kill each other, who cares about that % of the population, in the end NO one told them to land in there. I know a lot of people think this, but there are inmates in Topo Chico who have not yet been convicted and sentenced of any crime. They have hardened convicts mixed in with guys just picked up for petty offenses. Federal and State offenses are also mixed. So do the zetas no longer move weight.? Are the now just a band of extortion experts? They still move weight.. Mostly in Texas..
To bad they didn't all kill each other. Along with all the corrupt guards. Not sure where the information that Zetas executed Gabriela Muniz was obtained. It is well documented that a splinter group from The Federation composed of Sinaloa, La Familia and Gulf Cartels which called them selves " LA NUEVA FEDERACION" They were adamant about cleaning up Z when they took credit that late December of 2010. Please Revise. Are you claiming that the original article doesn't say the Zetas did it? The whiners name is ADR , ano de gruey. He is a Latin King supporter his opinion doesn't matter. I doubt this Familia Golfo Sinaloa merger. Año De Rey = ADR? That's ghastly!Extorting the families for 100's a month so they don't get killed.Exactly like kidnapping for ransom but under a government umbrella.Sick! Boy I never thought of that 1:a shortage of 'rich' criminals to extort. @3:46 I saw the story on Business Insider earlier this afternoon. But those stories are really just a teaser for the full interview she did with Telemunco that will be aired Sunday. We will try to have that interview up in a video as soon as possible.